Doing the Speed and Agility workout inside is getting kind of tough. There just is not enough space for the agility ladder. I probably spend a minute during the workout moving it around. 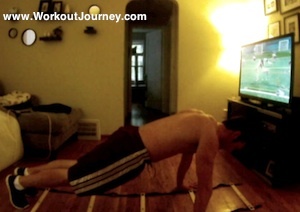 Hopefully the weather will break here in Michigan soon so I can do this outside (It was May when I did this workout. Not August when I published this). Getting better at the moves. Those in and out ab moves are still tough. I can get about half of them before I have to go back to the first box to complete them. Better off getting as many moves in with good form then doing sloppy moves just to say I almost did it. Did not have to wear the knee brace today. Feel like my knee is starting to get strong enough where I don’t have to wear it. Took a little video of myself so I can see how I’m progressing through the Speed and Agility workout. Half way through the Insanity Asylum workout. Only 15 more workouts to go.